Baseball Rules Differences author & umpire Carl Childress passed away over Thanksgiving week. Longtime Rulebook Umpire Carl Childress has died. Childress began officiating baseball in the 1950s—that would be his teens—and eventually worked his way into NCAA Division I baseball, at which time a March 1978 Referee Magazine article outlining 38 differences between Federation and Professional baseball led Childress to think about how to bridge the gap created by discussing the difference between high school and pro rules—which left college baseball out of the picture entirely. Here's what you're supposed to say on a foul ball: "Time!" Generally, we amateurs just say "Foul!" Here's what you're supposed to say on a fair ball: " !" The blank space means you're supposed to say nothing. A friend read it and didn't get it. 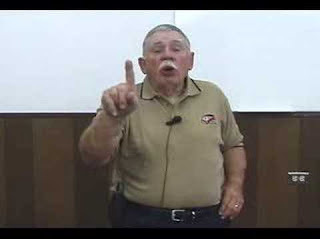 Still from Officiating YouTube Video: Controlling the Game. After joining Referee Magazine as a Contributing Editor in March 1982, Childress' first Baseball Rules Differences (BRD) took its initial form one year later as a short publication in Referee outlining the NCAA/Pro differences. Since then, Childress wrote, edited, and otherwise journaled material for Referee, Officiating.com, and Childress' own carlsbrd.com: He renamed the mechanic known as "Position 1" to the now-commonly used "Position A," served as a trainer in Texas, and—yes—continued working his slate of D1 college games. He collaborated with all manners of officials, and tabbed Hunter Wendelstedt as official OBR interpreter for his BRD, which he continued publishing annually through 2016. Speaking to the longevity and gravitas of "Papa C" in baseball officiating circles, Carl's BRD reached 34 editions under his authorship: It is the UEFL's book of choice for deciphering rule differences for FED/NCAA/PRO Case Plays matters. Carl Childress was 79 years old (April 23, 1937).